British Beatles Fan Club: The Beatles "Words of Love" - New Animated Video! Check out the premiere of The Beatles new animated video “Words of Love” below! The video of The Beatles performing the Buddy Holly song “Words of Love” appears on ‘On Air - Live at the BBC Volume 2’ available now. In 1994, The Beatles’ Live at the BBC was released to worldwide acclaim - hitting number one in the U.K., number three in the U.S. and selling more than five million copies within six weeks. The new companion to The Beatles’ first BBC collection, On Air – Live at the BBC Volume 2, is available now for digital pre-order exclusively on iTunes (www.iTunes.com/TheBeatles). On Air will be released on Monday, November 11; the Mastered for iTunes LP includes a 48-page booklet. Newly remastered, The Beatles’ Live at the BBC will also make its global digital debut on November 11 exclusively on iTunes. Sounding and looking better than ever, Live at the BBC’s Mastered for iTunes LP is also available now for pre-order exclusively on iTunes (www.iTunes.com/TheBeatles). This first collection of the group’s BBC sessions mixed versions of their hits with a treasure trove of 30 songs The Beatles performed on air but never released on record in the 1960s. The compelling track list ranges from a rare performance of the little known Lennon-McCartney original “I’ll Be On My Way” to covers of classic rock ’n’ roll and contemporary rhythm and blues songs. At the time of its original release, Live at the BBC was hailed by Rolling Stone as “an exhilarating portrait of a band in the process of shaping its own voice and vision.” It earned a GRAMMY® Award nomination for Best Historical Album. Between March 1962 and June 1965, no fewer than 275 unique musical performances by The Beatles were broadcast by the BBC in the U.K. The group played songs on 39 radio shows in 1963 alone. Ringo Starr said in 1994, “You tend to forget that we were a working band. It’s that mono sound. There were usually no overdubs. We were in at the count-in and that was it. I get excited listening to them.” On their busiest BBC day, July 16, 1963, The Beatles recorded 18 songs for three editions of their Pop Go The Beatles series in fewer than seven hours. Like its critically acclaimed predecessor, On Air includes audio of The Beatles talking to DJs Brian Matthew and Alan Freeman and Pop Go The Beatles hosts Lee Peters and Rodney Burke. When first broadcast, pop fans were amazed to hear such witty irreverence on the rather formal BBC and it is great fun to hear these extracts now. In addition, On Air releases, for the first time, the group’s candid interviews for the Pop Profile series recorded in November 1965 and May 1966. 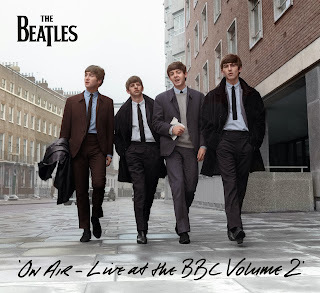 Live at the BBC was assembled by George Martin in 1994 and On Air - Live at the BBC Volume Two was compiled and researched by producers Kevin Howlett and Mike Heatley. Both albums have been meticulously mastered by engineers Guy Massey and Alex Wharton at Abbey Road Studios. The booklets for both collections include Kevin Howlett’s essays on the history of The Beatles’ BBC radio sessions and his detailed commentaries on all of the tracks.